It's been said numerous times over the past several months that Captain Marvel will be the Marvel Cinematic Universe's strongest superhero, but Brie Larson may have just confirmed it by stating that character can "move planets." Marvel Studios boss Kevin Feige revealed earlier this week that Carol Danvers will be the new face of the MCU for Phase 4 and beyond, leading to questions as to how Captain Marvel will fit into the upcoming Avengers 4. We already know that she'll have a significant role to play, but details are obviously under wraps for now. While we've been teased about how strong Captain Marvel will be in the MCU, Brie Larson gave some significant intel about exactly how big of a force she will be in the MCU. In a new red carpet interview, Larson was asked about the upcoming Captain Marvel, which is still filming in and around Los Angeles. The actress was tight lipped about specifics, but she had no problem revealing the immense strength of Carol Danvers. Larson had this to say. "She's so strong. She can move planets! So, to me, it's like how far can I go with this strength?" 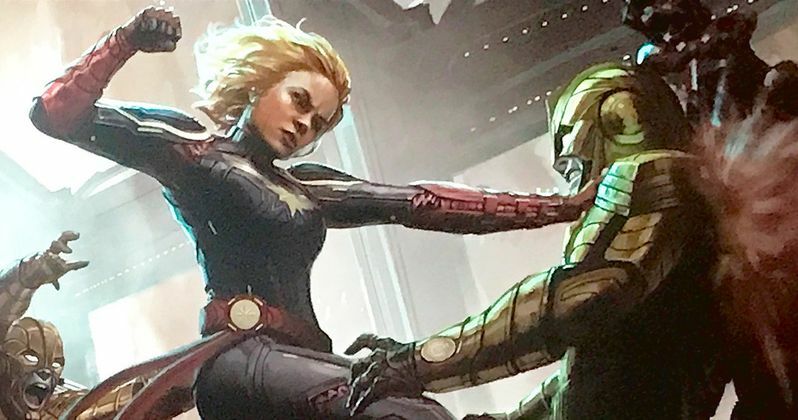 It looks like Thanos and the Infinity Gauntlet are going to have a new opponent when Captain Marvel joins up in Avengers 4. Sure, the Mad Titan was able to rip a moon to pieces and throw it at the Avengers, but it sounds like Captain Marvel will be able to hold her own when it comes to interplanetary rumbles with planets and moons for weapons. It's possible that Brie Larson could be playing up the strength of Carol Danvers, but that seems unlikely. Why would you make something up about the ability to move a planet? Brie Larson has also recently talked about how strong the production of Captain Marvel has made her in real-life. The Academy Award winning actress says that her training and filming has made her much stronger than she ever realized. To prepare for Captain Marvel, Larson trained for nine straight months to build up her physical strength. When it comes to lifting weights at the gym, Brie Larson is killing it, saying, "My highest right now is 215 pounds in deadlifts, 400-pound hip thrusts." It doesn't sound like anybody will want to mess with Larson or her fictional counterpart. Avengers 4 screenwriters have said that Captain Marvel and Ant-Man 2 will have large roles to play in setting up the film to end Phase 3 of the MCU, which makes even more sense now after Kevin Feige's comments. The Quantum Realm from Ant-Man is expected to be a huge factor in Avengers 4, while Carol Danvers' involvement was teased at the end of Infinity War. While we wait for more information about how exactly Captain Marvel will fit into the MCU, you can check out the red carpet interview with Brie Larson below, courtesy of the E! Entertainment YouTube channel.